The High Street Group is a property investment & development, financial & claims business based in Newcastle. Since starting our relationship with The High Street Group in 2011 we have been tasked with a multitude of print and online design work, including the development and ongoing support for many of their companies websites. For this project we were asked to create a group website that could be used to give information about the main company and also showcase all of the companies that they have within the business. The main challenge we faced was creating a structure that was highly flexible and could grow as their company grew. Working closely with their marketing team, we developed a sitemap that divided the content into sections that would allow for sub pages to be added as and when required. Once we were happy that the site could expand with the needs of the company we began to develop a site that incorporated their existing branding. 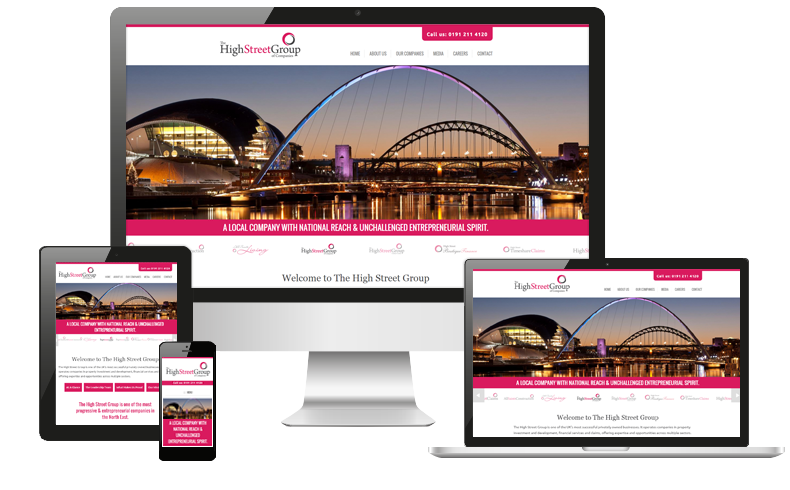 As it was important for The High Street Group to be able to easily update the content and add news and press releases we built the site using WordPress. Alongside the main website we also developed an Email newsletter template that could be used to share information to their subscribers.